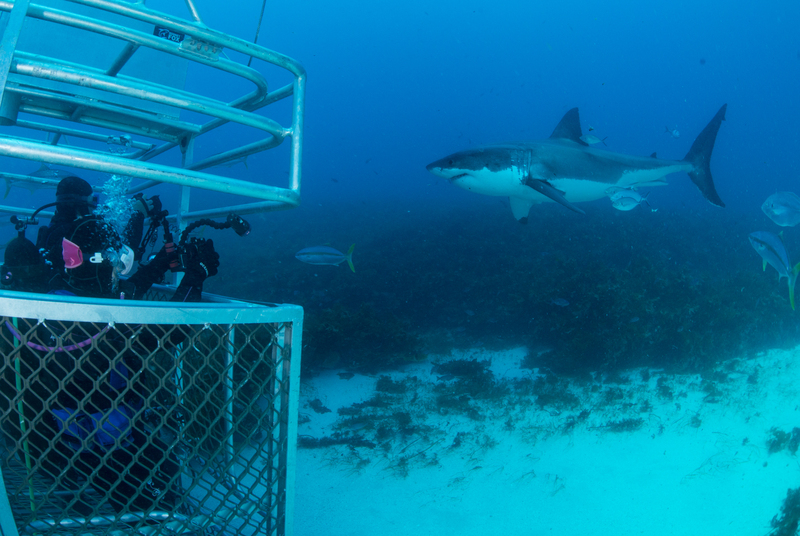 Lately I’ve been having lots of Bucket List dive adventures. (According to my oncology team, there’s not a whole lot of time left in my bucket, so I’ve been jumping on as many planes and boats as possible under doctor’s orders to make the most of whatever time is mine left to spend.) In the last month and a half, I’ve been 1500 kms past Cairns to the outer Great Barrier Reef and the Coral Sea with a small group of dive buddies to play with reef sharks, giant potato cod, olive sea snakes and more. 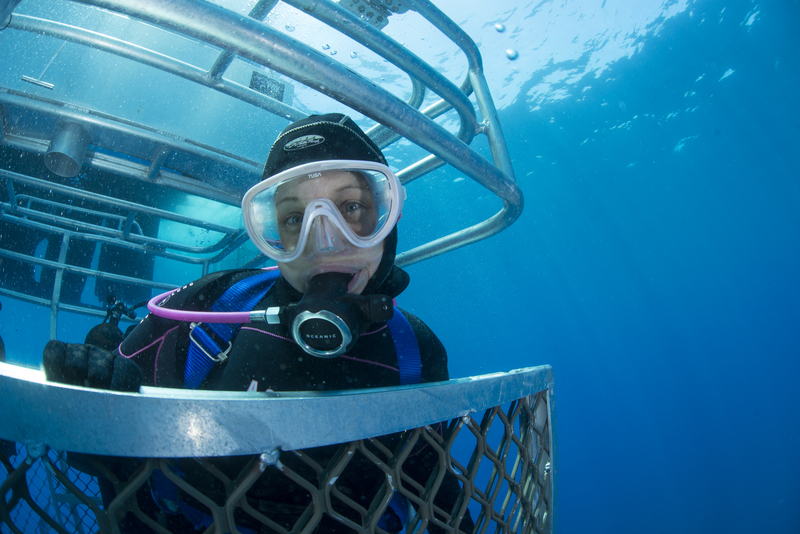 Last week I spent four days on Stradbroke Island with Spunky Abe filming the majestic manta rays. 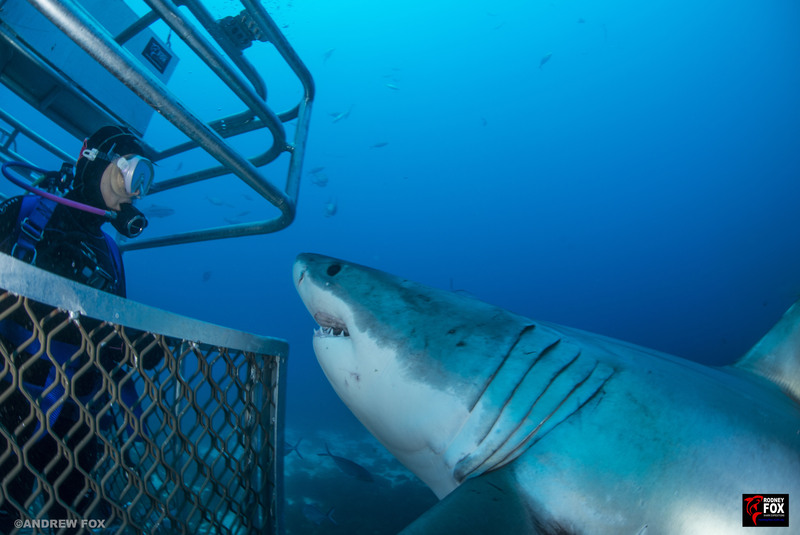 And earlier this week I returned from a solo three day cage diving expedition with one of the biggest critters on most divers’ Bucket Lists, the Great White sharks of Australia’s Neptune Islands. 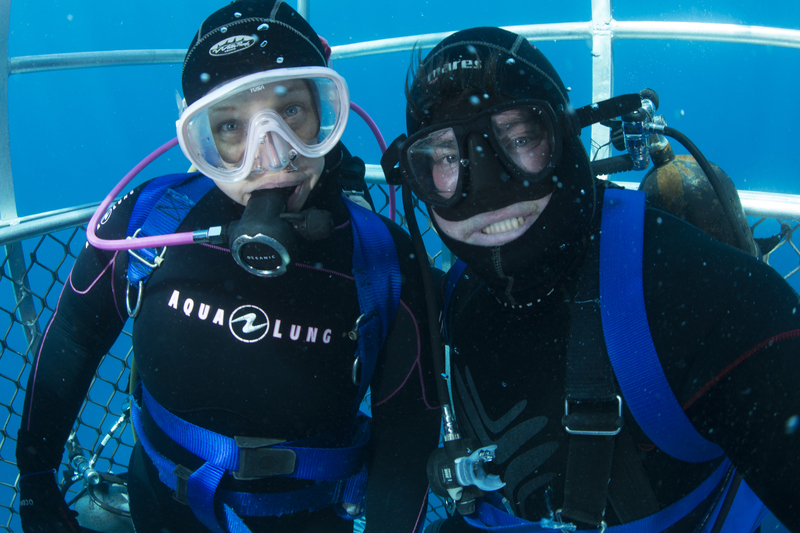 In my travels, I love meeting new people, and often when I talk to them about my Pink Tank Scuba blog, they ask me ‘Is that what you do for a living?’ It’s a strange and loaded question. What they really mean is ‘Is this how you make money?’, as though somehow money is the currency by which all human activity must be measured and validated. While I would love my dive trips to be sponsored, alas at this stage I pay for all of these adventures myself. When I tell people ‘I’m retired’, they always look at me strangely and reply ‘But you’re too young to be retired’ and of course they are absolutely right. I try to put off telling strangers that I no longer work due to terminal illness for as long as possible so that they have an opportunity to get to know me before they have the chance to pity or pigeon-hole me. Often, they have no idea that I have been diagnosed with advanced, late stage cancer until well after we’ve parted ways and they discover the truth via my blog or Facebook page. When they first meet me in person, they cannot see past the bliss on my face or the passion in my voice to the tumours that lie beneath the surface as I prattle on about my endless love for the ocean and all the beautiful creatures that inhabit it. Despite the fact that I have now completed palliative radiation, because I chose scuba therapy over chemotherapy, I simply just don’t look sick the way many cancer patients do. So to answer their question: do I dive and keep my ‘scuba versus tumour’ blog for ‘a living’? ‘No’, I reply, ‘I do it for living’. Being submersed in the depths of the ocean is the only place that I ever feel truly alive. Someone told me recently that time spent underwater is not counted against the time we have left on land, so it makes complete sense to me to spend as much time underwater as humanly possible. 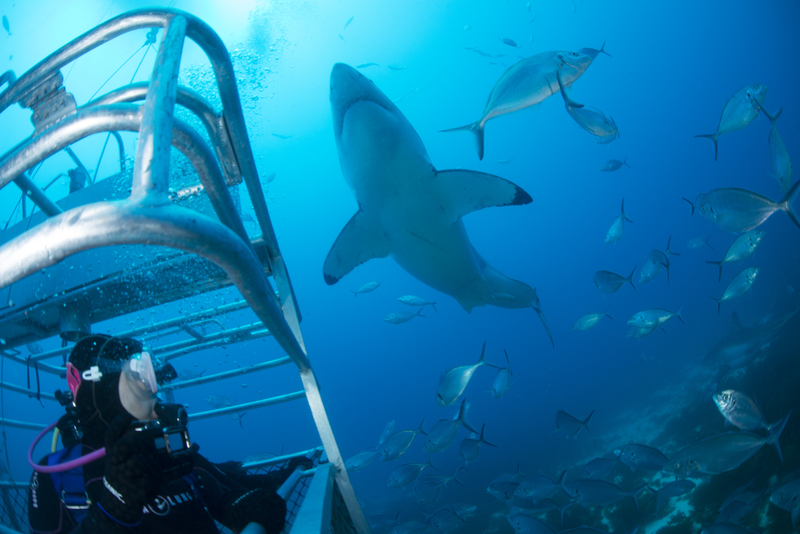 As we travelled out to dive with the Great Whites, we stopped for a fun dive with some gorgeous Australian sea lions. Why do these creatures play in the water with such energy, delighting in every opportunity for submersion and interaction? Watching how they glide and twirl, I can only think that the answer is because it brings them the purest pleasure and joy. Only here can they escape the anchor of land where freedom is limited and movement is cumbersome. Surely the shore is a much safer place to be, as their greatest predator, the Great White Shark, lurks nearby in the salty depths. But in order to be truly alive, to be nourished and fed and lost in playful abandon, sea lions must enter the ocean fearlessly, fully embracing the shortness and fullness of life. This is something that I identify with strongly. And yet I am as fascinated with the predator as I am with the potential prey. There is something deep within me that yearns to face what most people fear and to find majesty where others only see monster. Like death, the Great Whites are nightmarish leviathans in the minds of most, taking the shape of horrors too deep and dark to contemplate. But I have no fear. I have looked the unknowable creature directly in the blackness of its unfathomable eye and have found the truth of myself and the monstrous beast equally affirmed. To the depths of my core, I find myself even more in awe of life and less afraid of death than I have ever been before. And I reserve my very deepest thanks to all of my readers who graciously and fearlessly take this extraordinary journey with me through my blog. Every opportunity for me to share my images, videos and reflections with you truly means as much to me as my first-hand experience of these underwater adventures themselves. I continue to work on editing the films of my life-affirming encounters with Great Whites, manta rays, turtles, leopard sharks and more from the past month and a half, and I look forward to sharing them all with you as soon as I possibly can. Stay tuned! Pps Don’t forget to subscribe to this blog by email to be notified of future posts and to follow Pink Tank Scuba on Facebook! 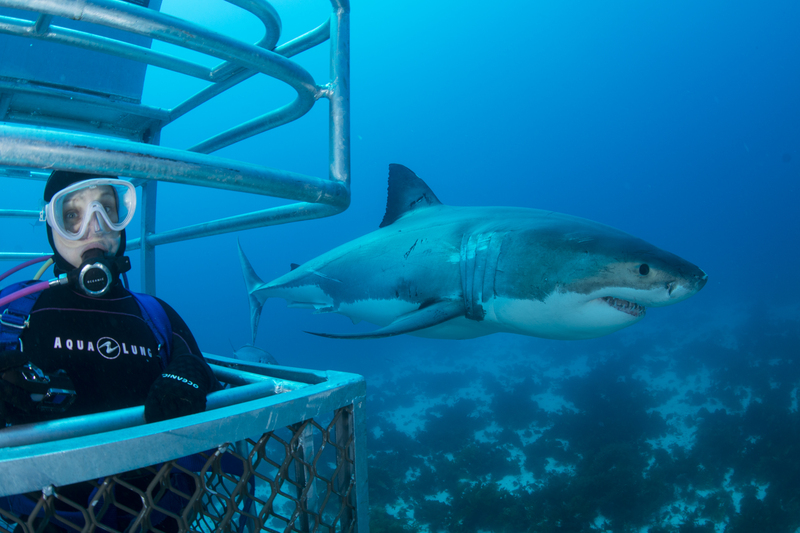 This entry was posted in Blog, Photos, Videos and tagged adventure, Australia, blogs, cage diving, cancer, death, dive, diver, diving, endometrial cancer, fear, fearless, fish, fun, great white, great white sharks, health, illness, life, marine, Melbourne, mortality, nature, neptune islands, ocean, photography, pink tank, pt hirschfield, rodney fox, rodney fox expeditions, scuba, scuba diver, scuba diving, sea lion, sea lions, Shark, Sharks, sickness, underwater, video, water. Bookmark the permalink. Lovely PT! Loved the blog! Was a really great weekend! Meeting u changed my own cancer journey! Forever grateful to have met u! I just missed out on swimming with two mantas off Agnes Waters in Queensland. I was out of the water and only one girl who was still in the water got to swim with them. It was her first snorkel dive too! Thank you! I had a wonderful day snorkelling that day and even saw a tawny shark. The mantas would have been the icing on the cake though. Very cool! 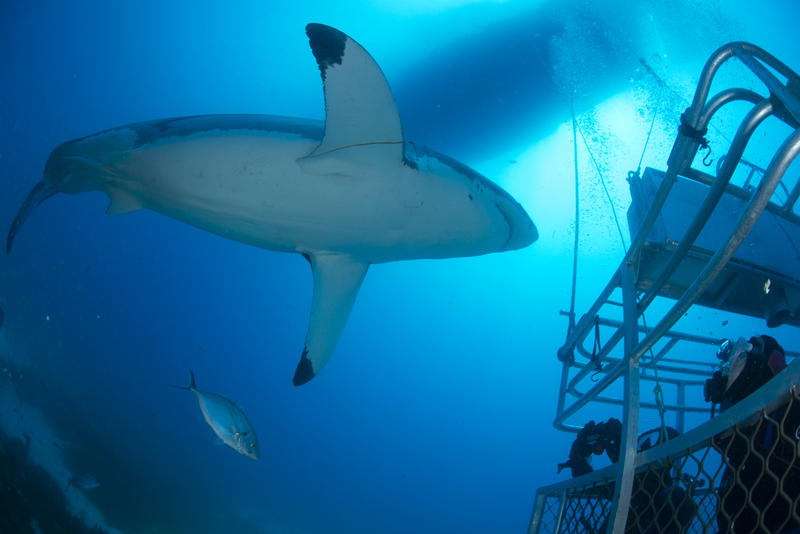 Love those pictures of the great white. Have a wonderful day. Thank you for a wonderful blog PT. I was lucky enough to dive with Andrew Fox earlier this year, and this blog brought back all those feelings of awe when you first see those majestic creatures. But more than that, it reminded me how wonderful the underwater world is and how lucky we are to experience it as scuba divers. Thank you for sharing so much of your “living” with us. I have only gone diving once in Hawaii, and really love seeing your images and reading your words. You give courage to all of us who are in the fight. God bless. PT – I just love reading your narrative of your experience. You are such a fantastic writer and capture the emotional level of diving and your journey. I felt like I was right there with you and those photos, as I have previously mentioned, are the “Hall of Fame” of Hall of Fame shots. I love you “living” your dreams. You are a special person and so glad we have crossed paths. Keep on Keepin on because we have lots of diving to do together. 🙂 🙂 Say hey to Abe for me too. I’ve greatly enjoyed every one of your posts…I hope your bucket list fulfillment continues for many more years…. Bucket list trip indeed! Great trip, great write up! Thanks for following my blog and I hope to run into underwater some day. Stay strong!